This is a guest post! Please join me in Welcoming Krista of Covering the Bases! Hi guys! I’m Krista from Covering the Bases. I’m a fashion, lifestyle and travel blogger based in New York City and I’m so happy to be guest posting today! 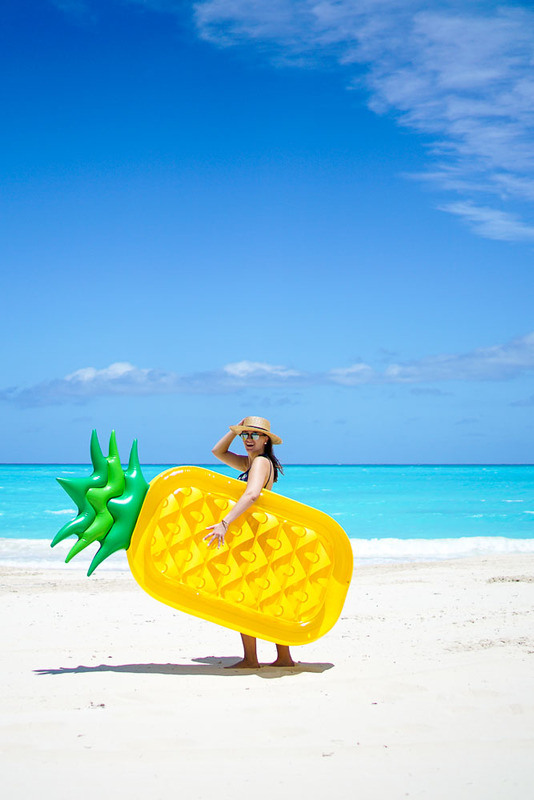 I make a point every year to travel to a new island in the Caribbean and so far have been to Aruba, Grand Cayman, Jamaica, Saint Lucia, Turks and Caicos, Bahamas and Punta Cana. Not too bad, right? Thankfully JetBlue flys all over the caribbean and since they’re based in NYC, flights are pretty affordable and the travel time is anywhere from 3-4 hours! The questions I get time after time is: what’s your favorite island? where should I go on vacation? And my answer is always this: Exuma. Exuma is part of the group of islands in the Bahamas and below I hope to show you just how amazing it is. Enjoy! How to get there: Exuma actually has it’s own airport (thankfully) so you’re able to fly directly there. I know American and Delta fly there direct from Miami and Atlanta. We flew from New York (LGA) to Miami and then to Exuma. Where to stay: There are a ton of really nice hotels on the island but when we went we stayed at Sandals Emerald Bay (you can see my full review HERE) and honestly had one of the best vacations of our lives. The hotel offered so much, was all inclusive, and was in the perfect place on the island. I highly recommend checking them out if you decide to go! I’m all about the beach and the ocean* as long as the water is clear and the beach is clean (I know). The beach at the hotel was out. of. this. world. amazing! They cleaned it every morning so there was no rocks/twigs/algae and the water itself was not only the bluest water I had ever seen but the clearest. We would go pretty deep too and could still see our feet! We also didn’t run into any fish or creatures in the water (but Im not sure why). 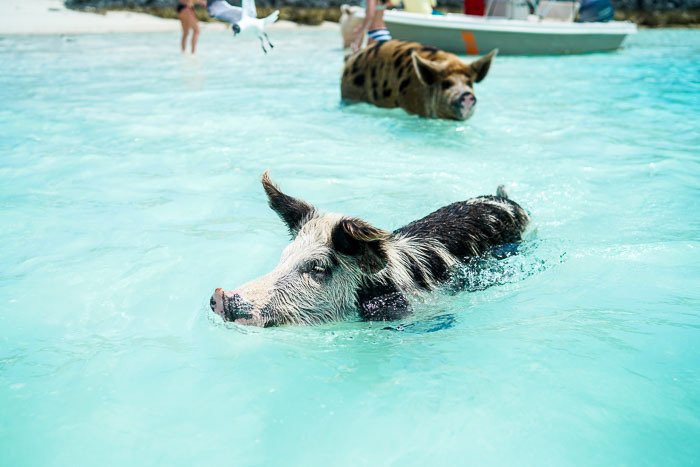 I know I know it seems TOTALLY crazy but hear me out: I love swimming with animals (see below). My first experience was swimming with sting rays in Grand Cayman and it was so scary but so thrilling. Thats the same with these sharks! They are 100% wild nurse sharks and they can be found at Compass Cay. I guess they chose not to eat people because they are fed fish on a regular basis (they were literally throwing food into the water when I got in). They let like sandpaper and didn’t understand personal space. I was terrified but it was so. much. fun! You pay I think $10 (maybe $20) to hang out with them as long as you want. And depending on the time of day, the water is either shallow or deep! This was actually the main reason I found out about Exuma and why we booked our trip. There are just random pigs on an island and you go over, feed them and hang out. It was really fun but like the sharks — actually worse than the sharks — the pigs don’t understand personal space. They are like me when I’m hungry: only focused on the food. As pigs normally are, they are HUGE. Like huge. And they will chase after you and stick their face in yours to get some food. It’s actually really funny and it was a blast. Just remember to come with some food and lots of water (they LOVE water). I think this sandbar specifically is the #1 reason why I love Exuma. I’ve been to a lot of places in this world but the best place I’ve ever been is here. We were literally boating around the ocean and just stopped at this sand bar that was no bigger than a football field (much narrower). When you walked into the ocean you would walk for 20 feet and still have the water only be at your shins. I mean how cool is that? It’s like walking on water. I wish more than anything I could have spent the day here. Do you see how clear that water is?! 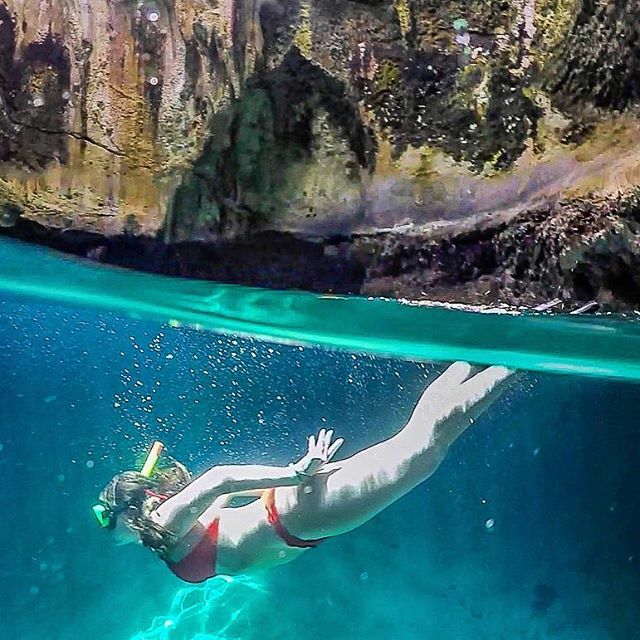 On all our vacations, we love to go snorkeling. Like mentioned above, you couldn’t do much of that at our hotel but we were able to do this as part of our excursion. Not only did we just snorkel we snorkeled in a CAVE. And not just any cave, the same cave (/grotto) that was in a James Bond movie! It’s called Thunderball Grotto and it has some of the most amazing fish I had ever seen. And like I keep talking about, the water is SO clear. We weren’t savvy snorkelers like we are now, but I thought it’d be good to share: we LOVE this full face snorkel mask — I got them for my boyfriend and myself and used them on our most recent trip to Turks and Caicos and it was a total game changer. Well, I don't think I'd ever EVEN think to see pigs on a beach. What fun you must have had. Lucky you….can't wait to see more. Oh I would be having such a great time with all the critters there. I've never heard of this area and must look it up for next years trip. Thanks for the suggestion. So beautiful! Wow your trip looks amazing! I've seen pictures of those pigs before, but I never knew where they were. Now that I know, and I see you can swim with sharks (I've been in a shark cage before and loved it!) I'll have to add it to my vacation list! Oh, the color of that water is amazing! Your beach photos are beautiful and I applaud your bravery at swimming with sharks! The beaches are so white and powdery that it doesn't even look real, and swimming with the pigs there is on so many people's bucket list. Thanks for the reminder that I need to return. The only white fluffy stuff that I'm seeing is snow.